Pursuant to Family Court Act §458-a, a support payor’s New York driver’s license can be suspended, if the arrears accumulated are equivalent to, or greater than, the amount of current support due for a period of four months. Obviously, this can become very problematic for someone with a child support obligation. A license suspension can potentially result in someone losing a job and falling further behind on child support arrears. If the respondent has accumulated support arrears equivalent to or greater than the amount of support due pursuant to court order for a period of four months, the court may order the department of motor vehicles to suspend the respondent’s driving privileges, and if such order issues, the respondent may apply to the department of motor vehicles for a restricted use license pursuant to section five hundred thirty of the vehicle and traffic law. The court may at any time upon payment of arrears or partial payment of arrears by the respondent order the department of motor vehicles to terminate the suspension of respondent’s driving privileges. For purposes of determining whether a support obligor has accumulated support arrears equivalent to or greater than the amount of support due for a period of four months, the amount of any retroactive support, other than periodic payments of retroactive support which are past due, shall not be included in the calculation of support arrears pursuant to this section. A restricted use license may be available pursuant to VTL §530 (as stated in the statute). 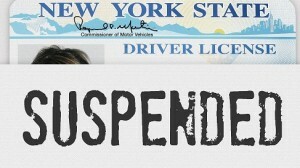 Make full or even partial payment and request a court order requiring the Department of Motor Vehicles to terminate the suspension and reinstate the driver’s license (as stated in the statute). Challenge the suspension with the DMV. The linked forms found here may be useful in challenging such a suspension. It should be noted that retroactive support is not included in the calculation of four months of arrears for the determination of a license suspension. If child support arrears have you facing a license suspension, you should immediately contact a family law attorney to discuss a modification of your child support order.